Pipeline Geopolitics: Why is Russia Maintaining Its Gas Transit Pipelines Through Ukraine Open? President Putin’s surprise announcement that Russia is ready to maintain gas transit through Ukraine has left people wondering whether both sides’ pipeline jostling over the past couple of years was ultimately all for naught if the pre-Maidan status quo ultimately returns. President Putin took the world off guard by announcing that Russia is “ready to preserve the Ukrainian transit” of gas, instantly provoking a wave of speculation over why both his country and Ukraine would even be interested in this after making many moves over the past couple of years to strategically disengage from one another. The 2014 success of the US-backed urban terrorist movement commonly known as “EuroMaidan” led to a serious security dilemma between Russia and its “revolutionary” neighbor after which both parties simultaneously came to the conclusion that they can’t depend on one another from that point onwards. Ukraine started exploring “reverse gas flows” through its preexisting pipelines in order to receive supplies from its western neighbors, which then set into motion Poland’s moves to build an expensive LNG terminal along its Baltic coast. The US saw – and some would say, engineered – a perfect opportunity to sell its costly LNG to the EU by hyping up the threat of Russia’s possible “weaponization” of energy supplies, relying on the mid-2000s stereotype that itself was just a media-driven manipulation stemming from Kiev’s own weaponization of its transit state status. Faced with eventually being cut off from its largest customers, Russia endeavored to diversify its export routes and clientele. The first part of this strategy saw it transforming the stalled South Stream pipeline into Turkish Stream and launching another Nord Stream pipeline, while the second half dealt with Russia’s “Pivot to Asia” and development of LNG exports to faraway markets. Concurrent with this, the US began to court its Croatian ally into footing a large part of the bill for an LNG terminal on Krk island, with the long-term vision being for America to supply the EU with gas through receptacles along the northern and southern Baltic and Adriatic coasts respectively of the Polish-led “Three Seas Initiative”. It’s hard to tell whether either side was able to wrestle any type of “concession” from the other prior to this announcement. There’s a chance that the past couple of years were mostly just one big bluff, notwithstanding the tangible progress that Russia and the US have already made regarding their European energy infrastructure, and that neither Russia nor Ukraine ultimately got anything from the other so they therefore decided to return to the pre-Maidan status quo. On the other hand, there’s also a very real possibility that some kind of deal might indeed be reached, whether related to the Donbass conflict or Ukraine’s internal stability. It’s impossible to know with any degree of certainty what kind of political horse trading might have taken place in East Ukraine, but as regards the country’s domestic affairs, Russia would have self-interested reasons in keeping its neighbor’s economy afloat through gas transit and the attendant fees Kiev would levy in order to delay this failing state’s collapse and stave off another migrant wave towards its borders. There are almost half a million Ukrainian asylum seekers in Russia on top of 2.6 million migrantsalready in the country, so Moscow might have decided that enough is enough and that it doesn’t want to potentially host another 3 million Ukrainians. Are Nord Stream II And Turkish Stream In Danger? Another possible reason behind Russia’s volte-face on gas transit through Ukraine could be that US sanctions against Nord Stream II might actually be more of a serious threat than either Moscow or Berlin have let on, and that the strategic uncertainty surrounding these threats and what would happen next might have compelled Russia to go ahead with its Ukrainian “backup plan”. It’s not to say that Nord Stream II will be cancelled or its scheduled opening delayed, but just that guaranteeing energy flows through Ukraine might assuage some of the US and Polish resistance to this project by proving to Moscow’s adversaries that the EU’s Russian-sourced supplies won’t be almost totally dependent on Germany and Turkey in the future. 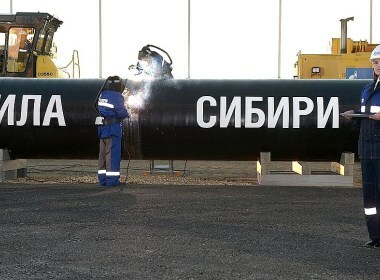 About the latter, the expansion of Turkish Stream into the EU via its proposed “Bulgarian Stream” branch would have to go through the same Brussels bureaucracy that ultimately led to South Stream’s cancellation, which itself was an entirely political decision that had little to do with Russia’s actual adherence to the EU’s many regulations. Although Hungary and the Balkan countries desperately need reliable energy exports from Russia, the EU might be more than willing to sacrifice its vassals’ living standards for the time being in order to indefinitely delay “Bulgarian Stream” just like it did with South Stream, wagering that the Azerbaijani-sourced TANAP-TAP and forthcoming “Israeli”-sourced East Mediterranean Pipeline could replace it in the future. Should Russia succeed in keeping the tap open through Ukraine, however, then the EU would have less of a reason to fear any strategic “dependence” on Russia’s German and Turkish Great Power energy partners because the “middle way” through Ukraine would still be available in mitigating any fear mongered “weaponization” of transit routes that some countries such as Poland are afraid that either of those two might one day resort to. Keeping things as they were with Ukraine might end up being a necessary “compromise” from Russia in order to receive the EU’s approval for “Bulgarian Stream” and calm Poland’s American-triggered paranoia over Nord Stream II supposedly being a “new Molotov-Ribbentrop Pact”. The obvious question on most observers’ minds is whether there’ll be a “back to the future” moment in the coming years if Ukraine once again weaponizes its transit status to provoke a Russian energy shutoff and therefore hold European countries hostage at the US’ implicit behest. That’s always a possibility but it appears less likely to happen anytime in the future than in the past. Post-Maidan Ukraine is much weaker than it’s ever been and the economy is literally on the verge of collapse. The country cannot weather any short-term disruption of energy supplies during the winter months in order to please its American patron because this could catalyze uncontrollably chaotic forces that might eventually undermine everything that the US and its on-the-ground allies worked so hard to “achieve” over the past 4 years. Even in the off-chance that Kiev is compelled to deliver this risky self-inflicted hit to its own very tentative stability, Russia might have already succeeded in diversifying its pipeline routes through Nord Stream II and Turkish/Bulgarian/Balkan Stream by that time, thus mitigating the possible impact of this asymmetrical attack and making it much less dramatic than what happened in 2005-2006. Of course, it can’t be assured that this “back to the future” scenario won’t unfold next winter before either of these two are online, which would in that case make it a deliberate provocation in order to increase the appeal of the US’ LNG and decrease European confidence in these two Russian pipelines, though there are slim odds that this will happen anytime soon just because it might lead to Ukraine’s all-out collapse and remove the present oligarchy from power. Reflecting on the aforementioned reasons for possibly keeping Ukraine’s pipelines open, Russia might have concluded that this is a necessary and pragmatic “compromise” in order to ensure that the construction of its Nord Stream II and Turkish/Bulgarian Stream pipelines to the EU isn’t disrupted by Brussels’ politicized bureaucracy, wagering that it’s also in Kiev’s self-interest to not interfere with these energy supplies no matter how much Washington might want it to in the future.